' Mickey Mouse Invitation - Digiscrap - Sisters, What! So one of the hobbies I that I love but don't have much time for is digital scrap-booking. Digital Scrap booking is scrap booking on the computer using photoshop or other programs of that type. You download all your papers, embellishments, and such then create your pages. I love it....the best part for me is all the amazing freebies you can find if you search right. And you can reuse the kits over and over. Like I said I haven't had a lot of time but I am hoping this summer that I can share a little bit of what I do with you because I am out of school for the summer. 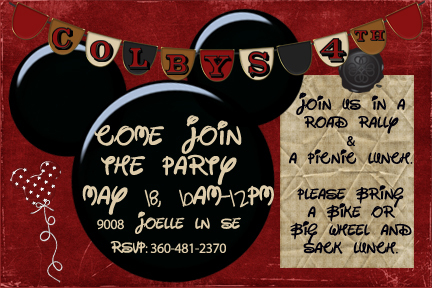 First up is the invite for my Son's 4th Birthday....he is all about Mickey Mouse Clubhouse right now... well for the last 3 years. So that is what he chose for his party theme.....I had to search hard to find a good Mickey Mouse Kit online and ended up paying for it because I couldn't find any freebies I really liked. The good side is that I can reuse the kit to scrap book pictures of our future disneyland trip, when we finally go. I design it as a 4x6 and then downloaded to the Costco website to be printed. At .13 a picture it is a great way to go. Kellybell designs also has some other great Disney kits and freebies on her blog. Very cute! What a fun font; perfect for your party! Very cute! So this might be a dumb question, but do you then print the invites off, or do you send them digitally to invite people? I've never done any digital scrapbooking-I still like doing it the old fashioned way :). Thanks for sharing at Handmade Tuesdays. I printed them up at Costco. I have done sent out emails before also but handing them out is so much fun. I got into digital scrapbooking because I didn't have the space for scrapbook stuff and little boys around so I couldn't leave it out. I felt like I was constantly pulling it out and putting it away for the few minutes of spare time I got. So that is why I switched. Love to still create things with paper when I have time.